Dr. Winthrop has been a leader in the Santa Barbara medical community for over twenty years, providing excellent ophthalmology care to those seeking relief from a variety of conditions. The Santa Barbara community consistently names Dr. Winthrop "Best Ophthalmologist” or "Best LASIK Surgeon" through the Santa Barbara News-Press and Independent reader polls. In fact, his reputation is worldwide, drawing patients from abroad. Dr. Winthrop attended college at UCLA and graduated Phi Beta Kappa. He then earned his medical degree at USC, where he graduated first in his medical school class, and where he was voted into the Alpha Omega Alpha medical honor society in his third year of school. After his ophthalmology residency at USC, Dr. Winthrop trained as a cornea fellow at the prestigious Massachusetts Eye and Ear Infirmary of Harvard University. During his cornea fellowship, he was the recipient of the Heed Foundation Fellowship, a top distinction among ophthalmologists pursuing advanced fellowship training. Dr. Winthrop has been the co-author of several articles in assorted medical journals. Please see Curriculum Vitae for more detailed information. Certified by the American Board of Ophthalmology, Dr. Winthrop is a Fellow of the American Academy of Ophthalmology, a Fellow of the American College of Surgeons, a member of the American Society of Cataract and Refractive Surgery, and a member of the International Society of Refractive Surgery. He is also a member of the California Association of Ophthalmology, the California Medical Association, and the Santa Barbara Ophthalmology Society. Locally, he is Past President of the Santa Barbara Ophthalmology Society and has served as Chairman of the Cottage Eye Center. 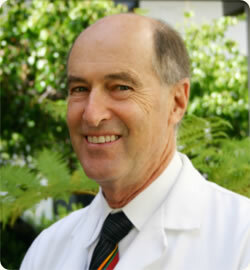 Dr. Winthrop is currently on the Board of the Santa Barbara Surgery Center. Dr. Winthrop taught cornea care anterior segment (corneal and lens) surgery to the eye residents at Jules Stein Eye Institute (UCLA) as an Assistant Clinical Professor of Ophthalmology from 1981-1996. In 1991, Dr. Winthrop began working with Summit Technology of Boston, the developers of the first excimer laser for vision correction, who named him a "visionary doctor.” When the FDA granted approval in late 1995, Dr. Winthrop had already arranged for the first laser to be available to the Santa Barbara community at Cottage Eye and Laser Insititute. Since then, Dr. Winthrop and his staff have performed over 10,000 LASIK procedures correcting nearsightedness (myopia), farsightedness (hyperopia) and astigmatism. He has continued to pursue all necessary avenues to ensure that our community continues to acquire each "next generation" development in the technology. Most recently, Dr. Winthrop has brought to the Tri-Counties the Allegretto Wave® Eye-Q, which corrects vision in a matter of seconds with more accuracy than ever possible before. His patients can be assured that they have access to the very best medical care available for laser vision correction. In addition to specialized cornea care, which includes transplants, LASIK, and PRK, Dr. Winthrop provides comprehensive ophthalmology care including contact lens care, laser surgery, and small-incision, no-stitch, phacoemulsification cataract surgery, performing over 9,000 lens implantation surgeries to date. His patients are constantly amazed at the miracle of improved vision that occurs with the use of modern surgical techniques. Dr. Winthrop performs his eye surgeries at Cottage Eye and Laser Institute, Santa Barbara Surgical Center and his own private Laser Center, all in Santa Barbara. Supporting local causes has always been important to Dr. Winthrop, whether through substantial fundraising or donated eye care. Among the beneficiaries are the Cottage Eye Center, SEE International (for whom Dr. Winthrop has also performed surgery for the needy), and many local schools. Winthrop, S.R., Cleary, P.E., Minckler, D.S., and Ryan, S.J. Winthrop, S.R., and Smith, R.E. Berman, M., Winthrop, S.R., Ausprank, D., Rose, J., Langer, R., and Gage, J. Investigative Ophthalmology (22:191-199, 1982) Nesburn, A.B., Smith, R.E., and Winthrop, S.R. "I visited three LASIK surgeons prior to finalizing my decision to have the LASIK procedure. I evaluated several categories that I believed would provide me the best possible outcome and quality of care. After meeting with Dr. Winthrop and his staff, I felt confident in my selection. Since my entire career has been devoted to the delivery of high quality healthcare, I know what to look for when selecting my own, and my family's health care providers. I appreciate the high standards of patient care that you and your staff provide. I am grateful to you and I am recommending you to everyone I know who is in need of ophthalmology care."